One afternoon I was sitting in my office working on the computer. I was pretty bored and thinking how nice it would be if I had a mystery to solve. Lucky for me, one walked through my door (FYI, you don’t need to come to the office, you can just call us). Mr. Samara (not his real name) was an older gentleman concerned about a once beautiful maple tree in his front yard. His tree had not leafed out well this year. The leaves present were small and slightly crispy, not a good sign for a tree. Mr. Samara gave me his address and asked if I could take a look at his tree and tell him what was going on. This is Mr. Samara’s tree in the front of his house. Upon arrival at Mr. Samara’s, I noticed right away that this tree had been abused by some “arborists” in the past. This tree was lions-tailed. Some scam artist convinced Mr. Samara this tree needed to be “thinned out so the wind could blow through”. What a bunch of manure. Click here to find out why this is a substandard practice. I thought that this poor pruning job may have contributed to the maples condition, but I suspected there was still one or more underlying causes. I examined the trunk of the tree for insect damage that may have obstructed nutrient flow to the canopy but there were no signs. Insects disrupt nutrient flow by breaking the cambium layer of the tree. This often results in canopy dieback and suckers below the damage. Insects always leave a calling card so they can be identified, but this tree was clean. Next, I looked at the root flares to see if they were present and healthy. Trees planted too deep will not have visible root flares. Girdling roots limit nutrient uptake by constricting the tree and usually cause irregularity in root flares. I also checked for fungal bodies around the base of the tree. Fungal pathogens that attack the roots can cause thin canopies as well since they can limit nutrient uptake. This tree had prominent flares with no signs of fungus so I ruled out those issues. I began thinking about any weather conditions that may have zapped the tree, however, I placed that low on the list of suspects because the neighboring trees seemed fine. All of a sudden I noticed the lawn, no weeds at all, perhaps a misuse of herbicide contributed to this issue. I took a tissue sample from the top of the tree to examine the leaves to see if they would provide a clue as to what happened. The stunted leaves and scorched margins could have been related to chemical burns. Unfortunately, those signs could also be attributed to weather (ruled out already), drought or overwatering, root compaction, root damage, and/or fertilizers and pH imbalances. I put herbicide as a possibility on my list of culprits but it just didn’t quite make sense. I would expect to see at least some damage to neighboring trees if vaporization of the product occurred. I asked Mr. Samara about the history of the property such as fertilizers and herbicides put on his lawn but he said he needed to check with his lawn care company and he would get back to me. “What about any type of construction activities?” I wondered if there was some underlying construction damage. “Hmm,” he said “I can’t think of anything.” They never can. “Oh, I did have a sprinkler system installed a few years ago.” Aha! A clue! perhaps when the contractors installed the system they cut some tree roots. Typically construction damage does not manifest in the canopy for several years. Could Mr, Samara be over-watering? Over-watering can lead to root die-back, which like drought, will cause yellowing leaves with scorched ends. Root die-back from over-watering combined with severing roots from trenching to install a sprinkler system might have caused this but I needed to know for sure. Once I got back to the office, I was thinking about everything I had seen and learned on Mr. Samara’s property. I wanted just a little more history on the tree but I think Mr. Samara had given me all the information I was going to get from him. I decided I needed some historical photos of the tree since they don’t lie (or mis-remember). The best place I have found for historical photos is none other than google street view. Mr. Samara’s tree exactly 5 years before he walked into my office. I have confirmed my suspicions. Construction damage is the tree killer. 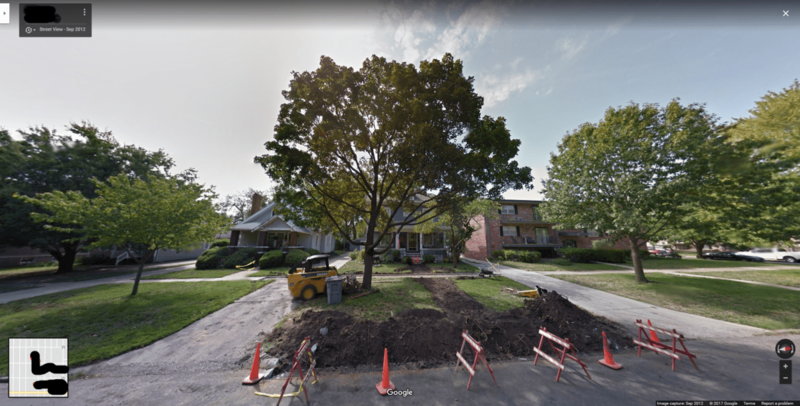 As you can see from the photo the tree was in pretty good shape (minus the lions-tailing) during the construction of the street curb, and two sidewalks. However, if you look closely at the areas where the soil was disturbed you can see numerous severed roots. And speaking of disturbed soil, what you don’t see is all of the soil compaction taking place under that skid steer. Healthy soil is 50% pore space which leaves room for water and air, both essential for trees. Compacted soil kills tree roots, and if severe compaction takes place, roots may not be able to penetrate the soil to regrow. Based on the information I obtained from questioning Mr. Samara and the photo evidence from Google, I started my report. I politely let Mr. Samara know about the substandard pruning for starters but informed him that it was not the cause of the decline. I showed him the picture from Google noting the severed roots and the soil compaction from the skid steer driving all over the yard. I explained how compacted soils reduce the amount of available water and air in the soil causing tree root decline. The roots cut during the construction process only compounded the root loss of the tree. Assuming more roots were cut during the sprinkler installation, no wonder this tree was in such bad shape. The tree no longer had the root system necessary to support the canopy, that is why the canopy was thin, and the leaves were small and scorched at the ends. Over-watering with the new sprinkler system could have exacerbated the problem, but it would be difficult to determine. However, I had enough information already to draw my conclusion. I let Mr. Samara know what I thought we could do to try to save the tree, and I gave him the likelihood of survival, which at this point I felt was pretty bleak. He thanked me for my time and a few weeks later I went by the once beautiful maple. It was gone and a young tree stood just beside where its doomed predecessor once shaded the neighborhood. Due to the fact that was no remediation was done to the soil to alleviate compaction, this young tree will have an uphill battle. Hopefully Mr. Samara doesn’t let “Cheapo Tree Trimmers” near this new tree, and hopefully he is done with the construction projects. 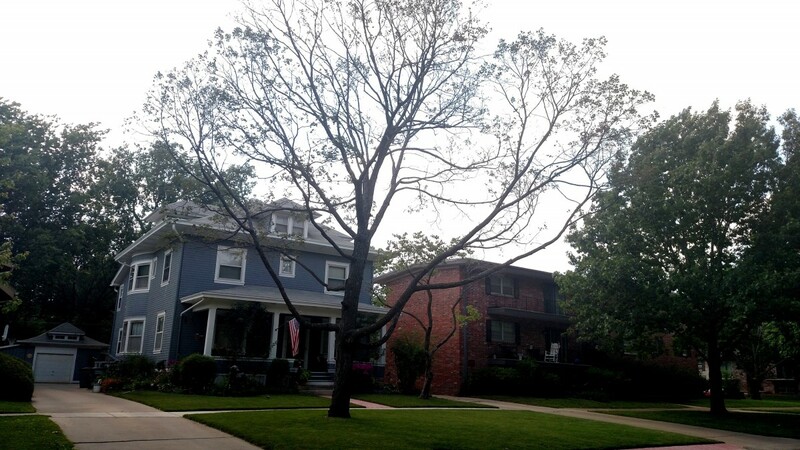 If you have tree problems or are trying to avoid future tree problems contact us.